New Rosenberg Ecofit-brand GREuG9 blowers feature 160-mm x 62mm impellers powered by UL-recognized electronically commutated (EC) motors. They are available in standard airflow/pressure models, and in models that automatically adjust fan speed to keep airflow or pressure constant in changing conditions. New single-inlet Ecofit forward-curved centrifugal blowers with EC motors for standard, constant airflow and constant pressure applications. 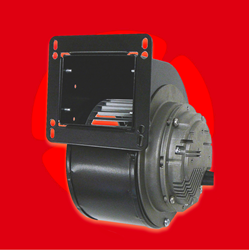 Electronically commutated (EC) motors in the new blowers allow for easy speed control, long life expectancy and low operating costs. Rosenberg USA has introduced a new family of single-inlet Ecofit forward-curved centrifugal blowers with 115 or 230-Volt UL-Recognized EC motors. They are available in standard airflow/pressure, constant airflow and constant pressure models.